As some of you may have guessed I’m really into everything vintage and shabby chic so decided to refurbish some old furniture pieces to create a shabby chic inspired bedroom set. I brought the pieces of furniture I wanted to use from a British Heart foundation store that only specialise in furniture and electrical goods. 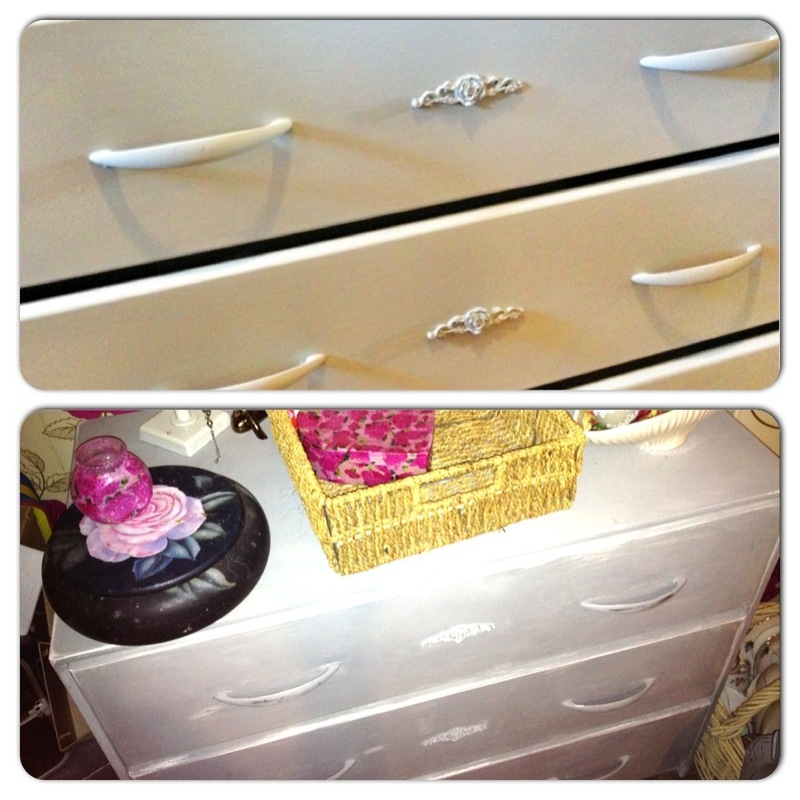 I also brought for the bedroom some white bedside drawers. These had some pretty mouldings on the front but one or two were missing. It also had some pretty porcelain handles. 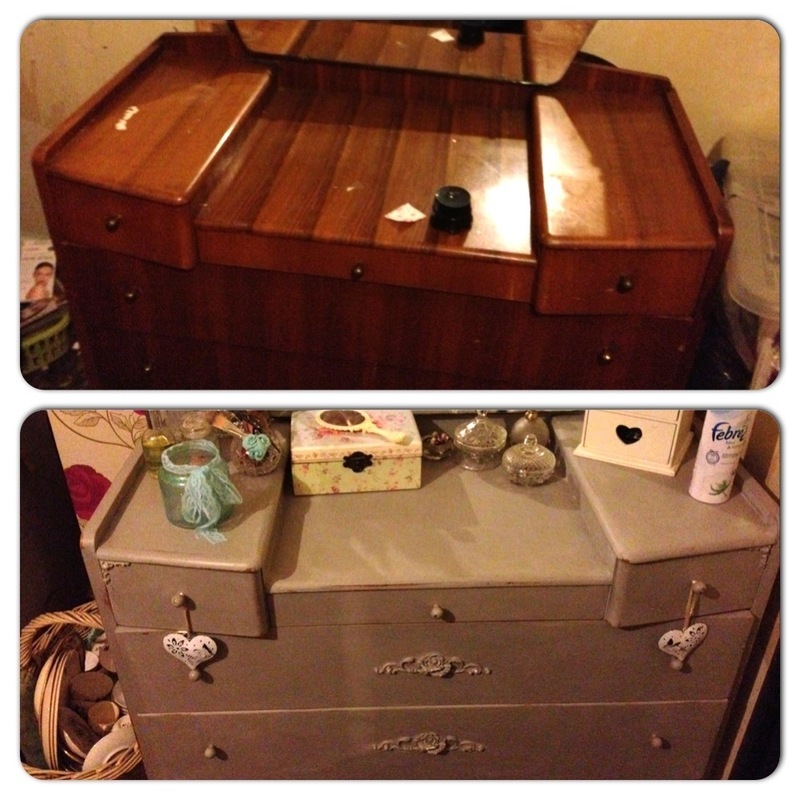 The bedside drawers were an amazing bargain at just £5. 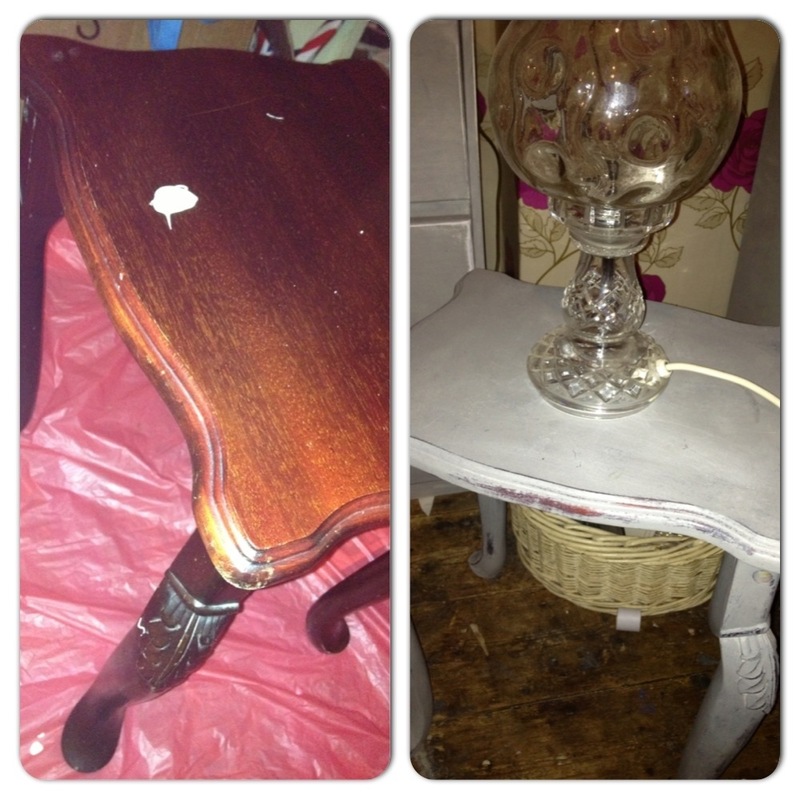 The last item I brought was a vintage French Mahogany Side/Lamp table that used to form part of a nest of tables. This again cost me just £5. 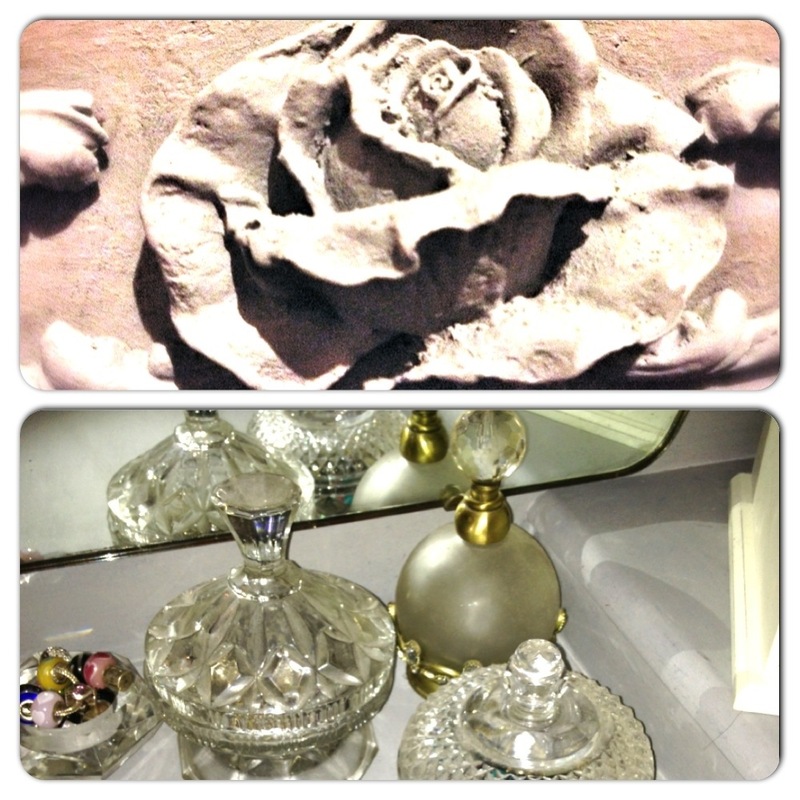 Feeling inspired by the mouldings on the bedside drawers I went on a hunt for some French inspired mouldings on the net. 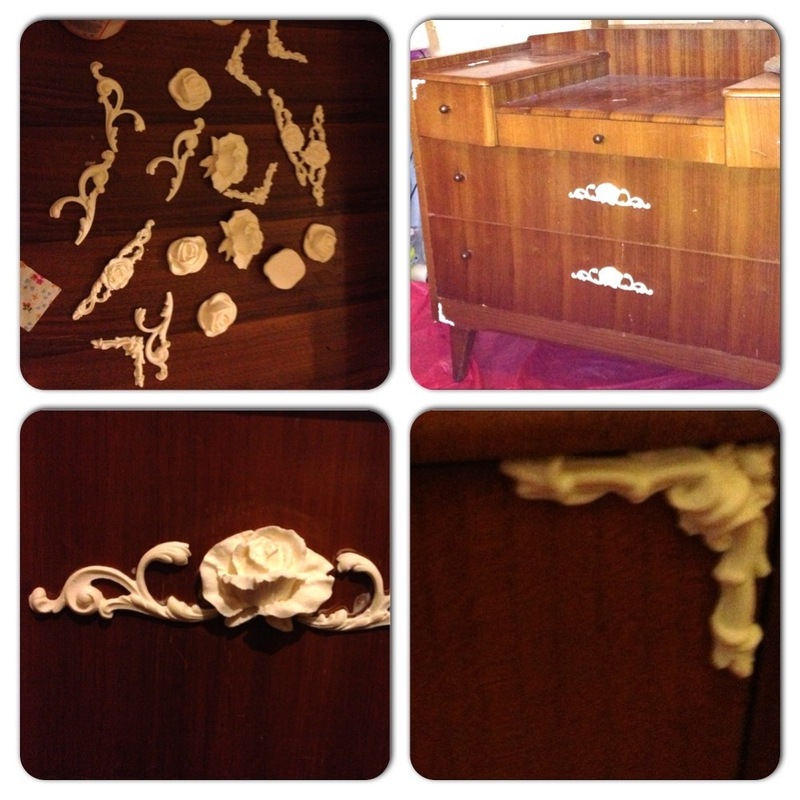 I found some lovely ones being sold by Chic mouldings via eBay. With this I purchased 4 floral corners for £3.49, 3 Rose and Ornate Scrolls for £6.99 and finally 2 large Rose and Ornate Scrolls for £12.99. My next decision was what paint to use. 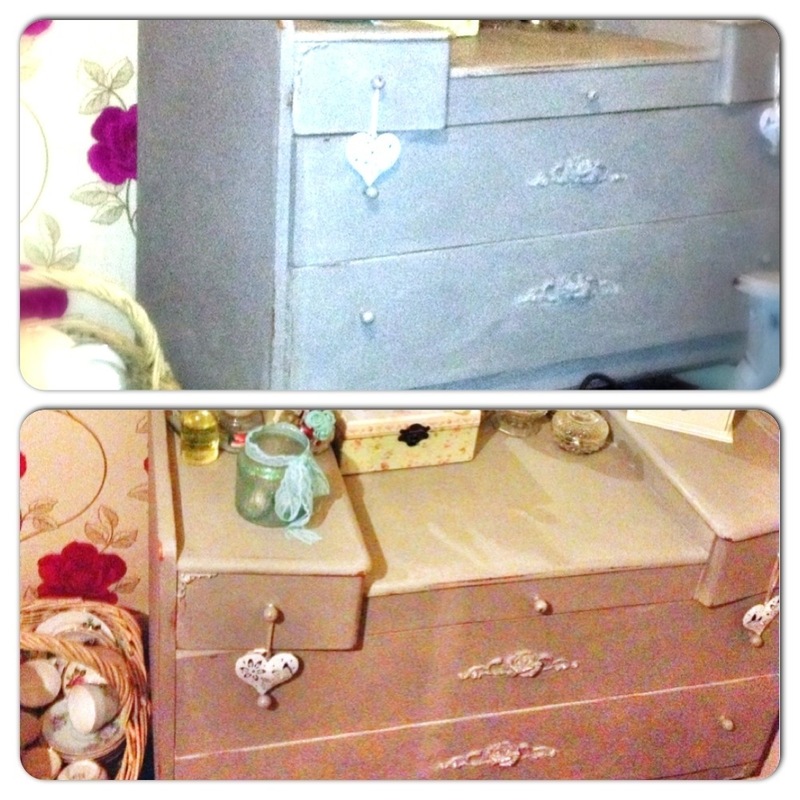 Having done a lot of research on the net I finally decided on Annie Sloan Chalk Paint in the colour Paris Grey. Luckily for me there is a store close by who sells the paint as these are only sold in selected stores. I also purchased Annie Sloan Clear Wax. I’ve heard many people state how expensive Annie Sloan paint is, and at £17 per litre at first I would have agreed. However I’ve used just over half a litre tin on all four of my items. 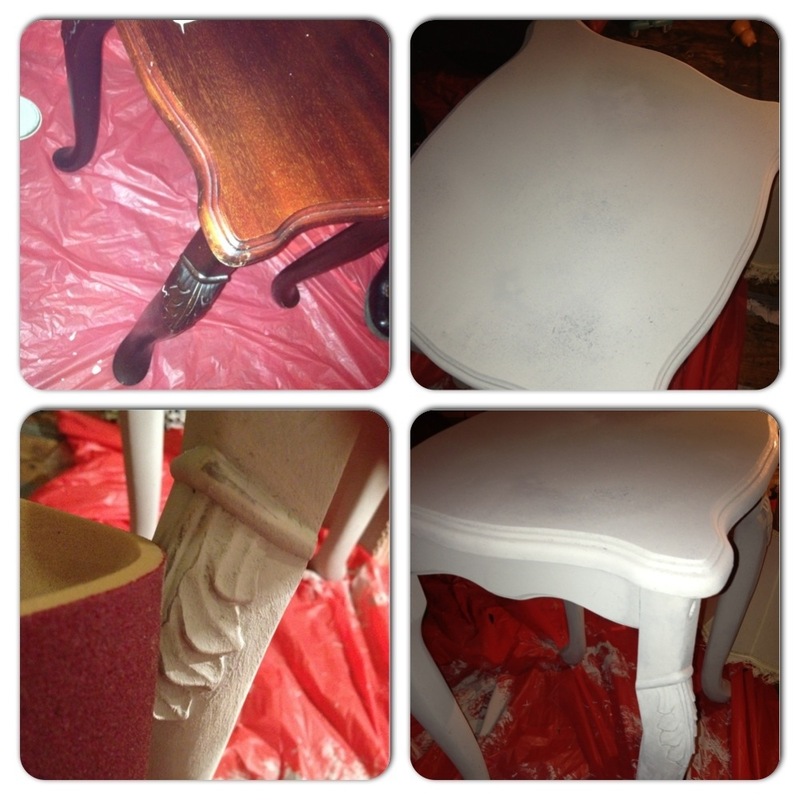 All but the lamp table received 2 coats of paint. The wax was priced at around £7.99 and again I’ve used about half a tin. I really can’t believe how far this paint goes! The best thing about Annie Sloan paint, that I’m sure anyone would tell you, is there is no prep work, the paint sticks to any surface even those that are highly varnished. The one thing I needed to do was brush and wash down all my furniture to remove dust and marks. 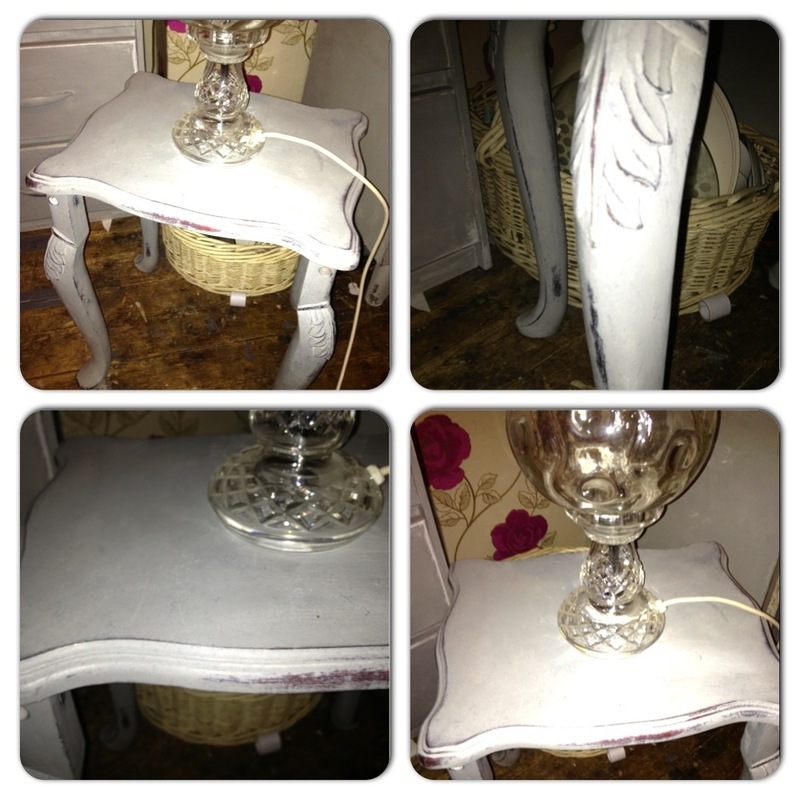 As this was my first time working with this paint I first tried it out on the smallest item… The side/lamp table. I used a big brush from the Harris range at homebase and a smaller brush that I use when using acrylic for the hard to reach areas, then I got going. 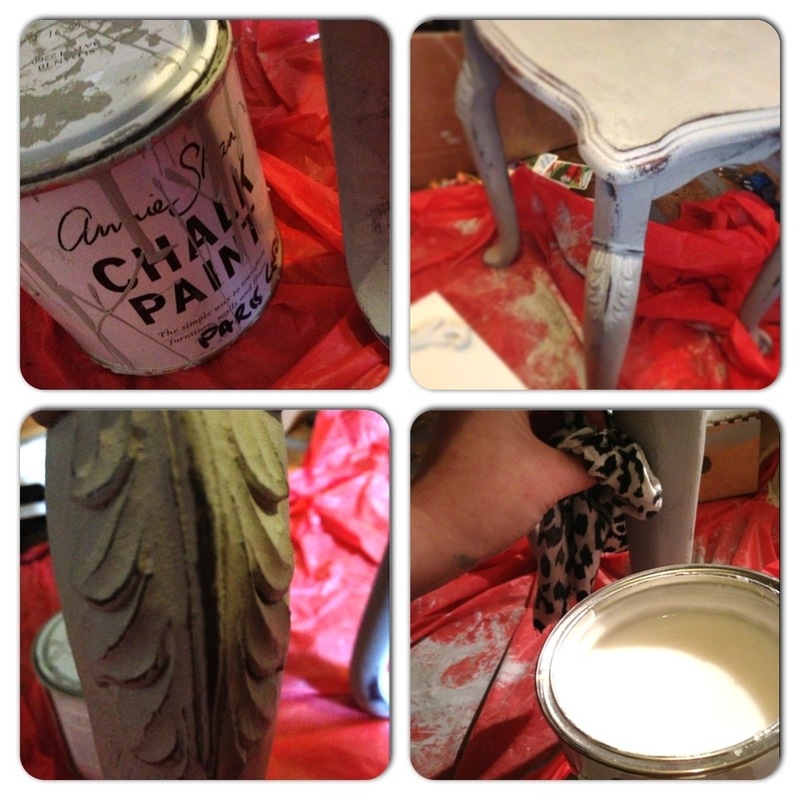 Chalk paint is really thick and you can add a little water. I didn’t really need to this for the side table but the longer I had the paint the thicker it became so on some of the other items I just added a little water to my brush. The paint went on really easily and gave good coverage. If your using this paint for the first time you will discover just how amazingly fast this stuff dries. This is why its important to ensure you haven’t got any drip marks, keep checking as you paint each section. I loved how the table looked with just the one coat of chalk paint and wanted a lot of dark wood to show through once distressed. A lot of people wax there wood, distress then wax again. I only needed to use this technique for the small bedside drawers as I found these harder to work with. The paint came of more easily so I decided to wax before distressing then wax again. Nonetheless I didn’t need to do this for the table, dresser or chest of drawers. So once my table was dry I used some 100 grit sandpaper to distress. 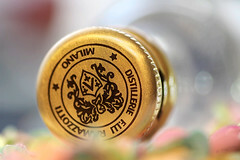 I paid particular attention to the corners of the table, the feet and sides. Once distressed to my satisfaction I used an antique soft dresser brush (that I found in a charity shop) to remove any dust. I then used a cloth to apply my wax working section by section. I applied the wax with the cloth and then used an old washed body power puff to buff where I had waxed. 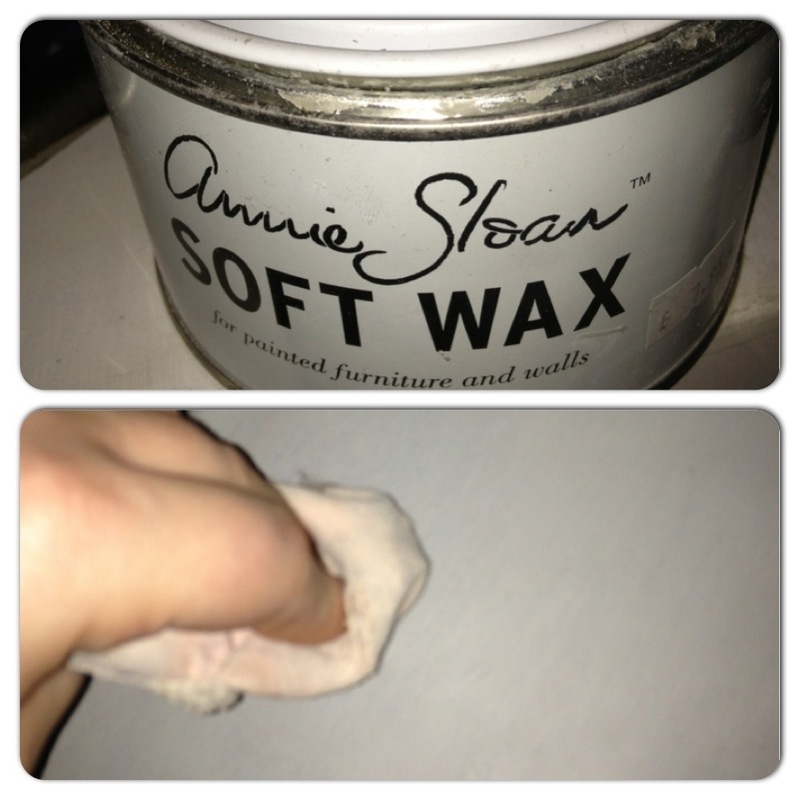 Its easy to tell when your wax is fully dried as it looks patchy as certain areas dry ahead of others. The darker areas are those that are still wet. 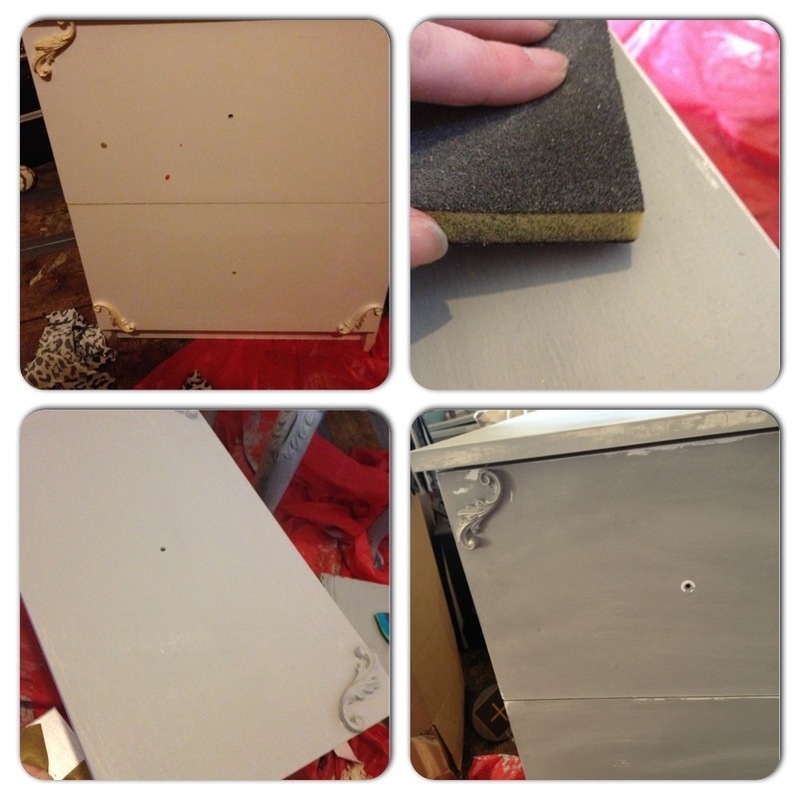 Before painting my bedside drawers I used the side of a wallpaper scrapper to remove the mouldings. I then took four of the removed mouldings and with some mod podge I stuck 2 to the top corners of the first drawer and 2 to the bottom corners of the second drawer. These were dry and strong within about 30 minutes. 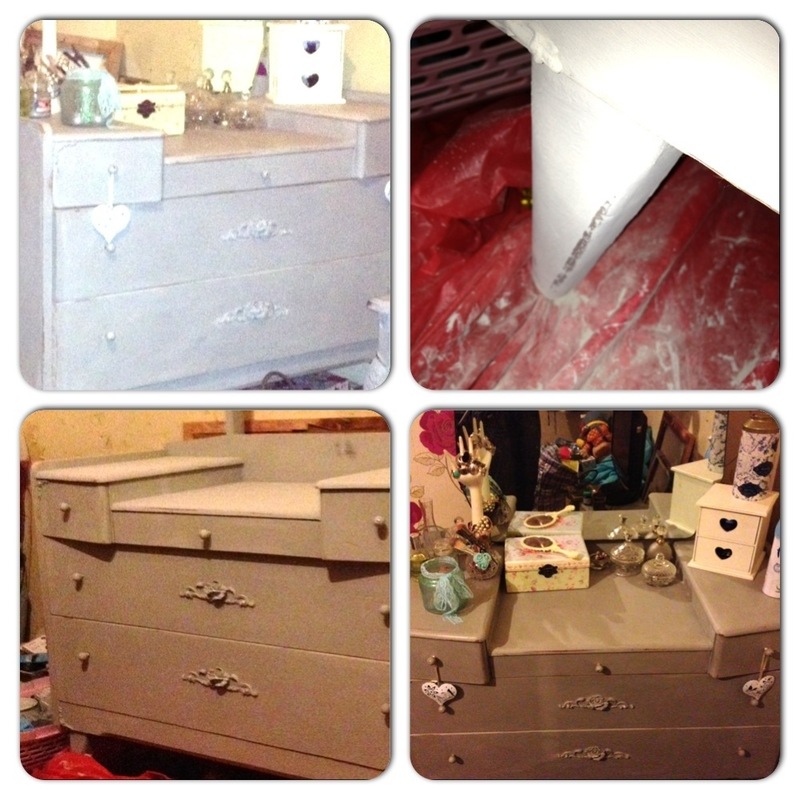 As mentioned my bedside drawers were much harder to paint simply because the wood wasn’t of such good quality. Despite the fact I liked the handles I removed them and replaced with some lovely floral handles I brought from eBay. 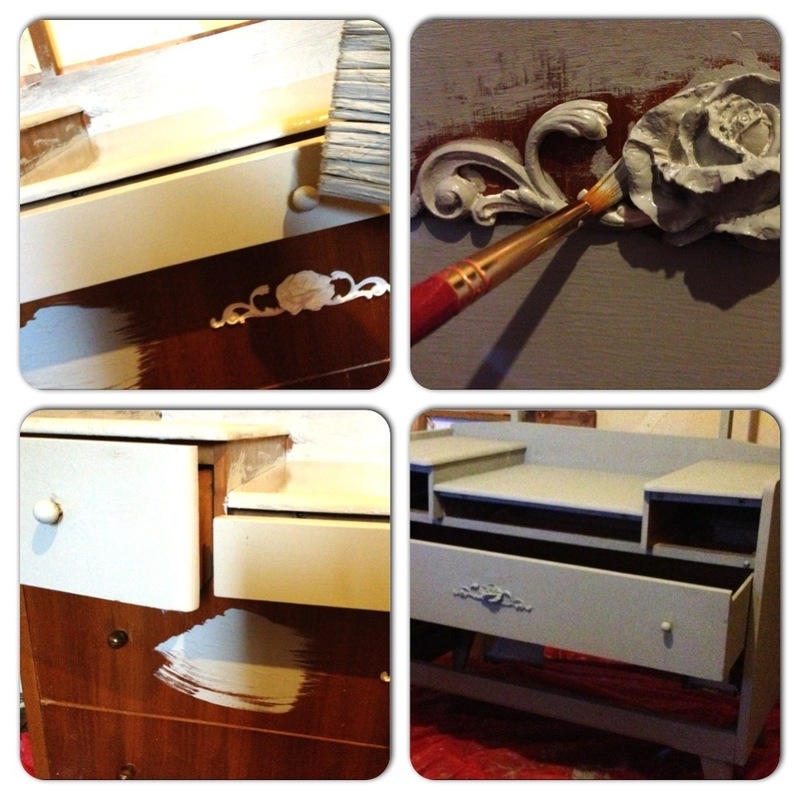 The bedside drawers were painted with two coats of paint and I added a little water to my brush as the paint had become quite thick. 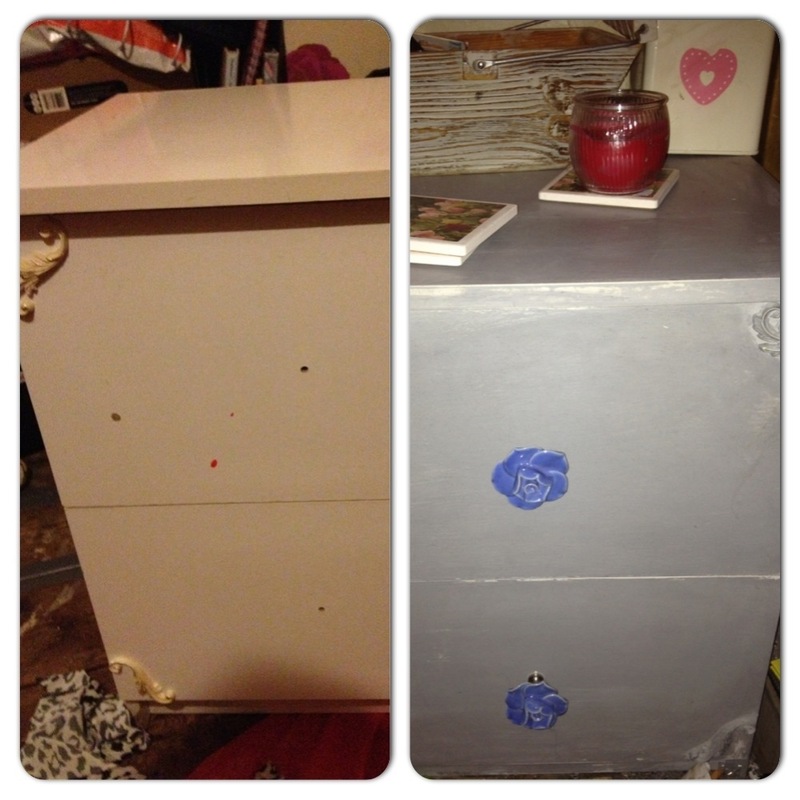 The bedside drawers got waxed both before and after distressing. 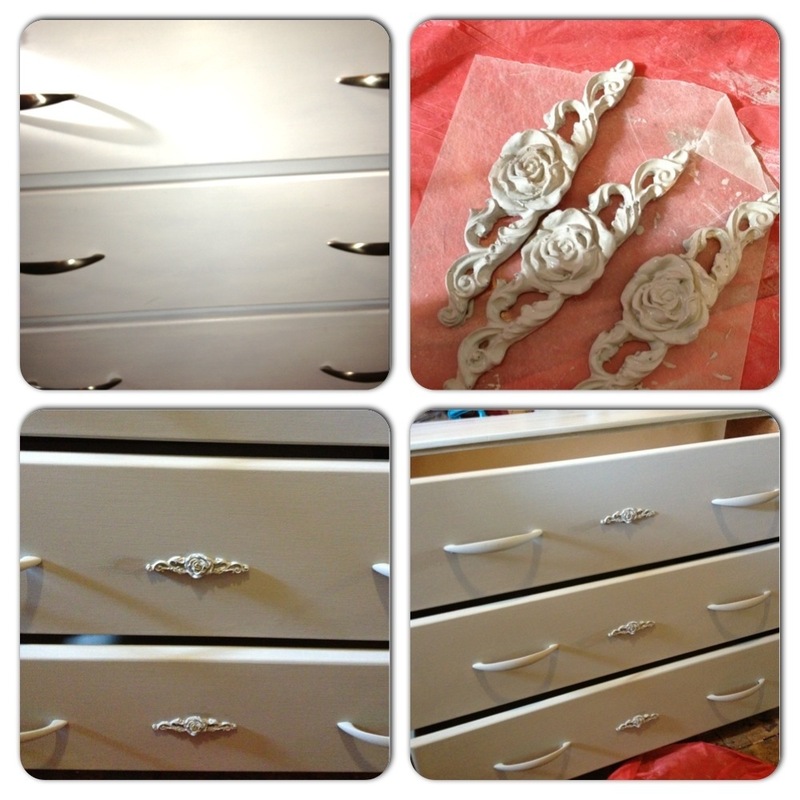 As for the dresser I removed the mirror and then using mod podge to stuck the 4 floral corners onto the dresser and then I took my large rose and ornate scrolls sticking one each in the centre of both my large drawers. 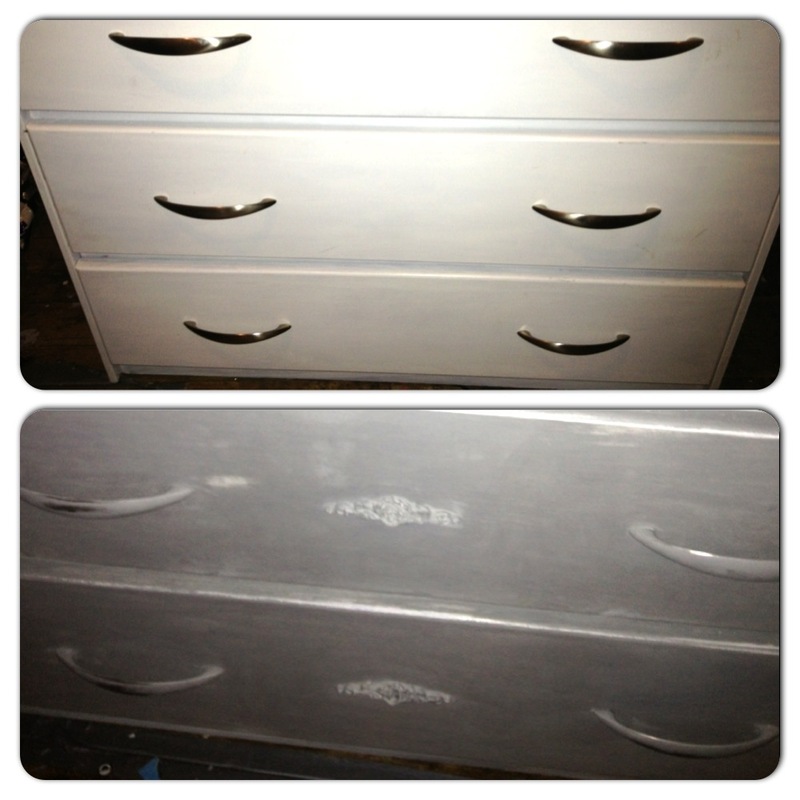 I applied two coats of paint to my dresser letting them dry for around 40 minutes in between coats. I didn’t remove the hardware as despite ordering some 8 beautiful crystal handles from eBay I was still unfortunately waiting on them arriving. Instead I just painted over the handles it already had attached. 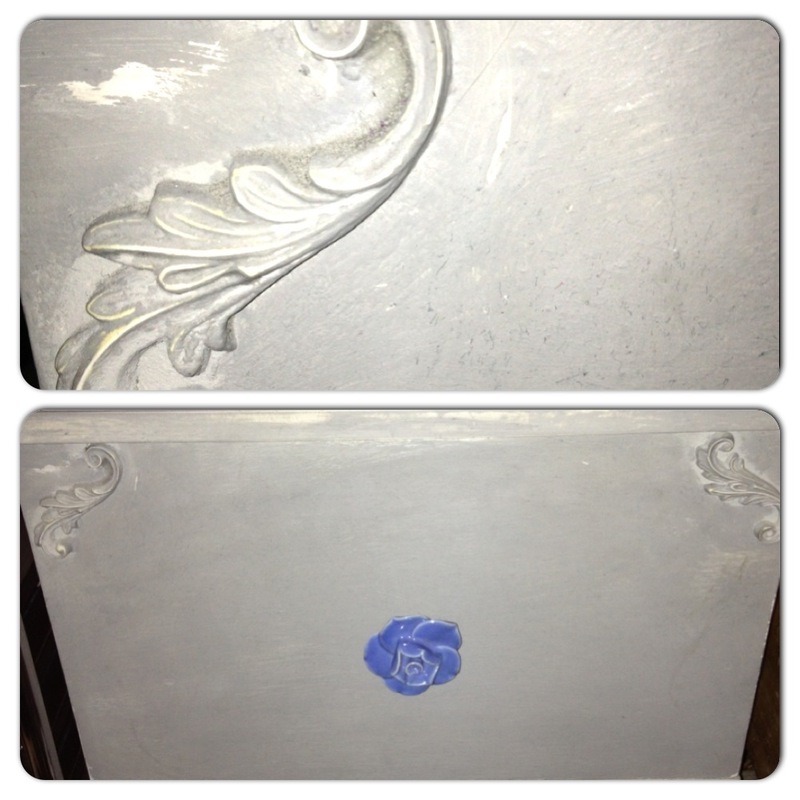 I had a lot of fun distressing this piece and was really pleased with the final result. I found this one took quite a bit of waxing but it was worth it. 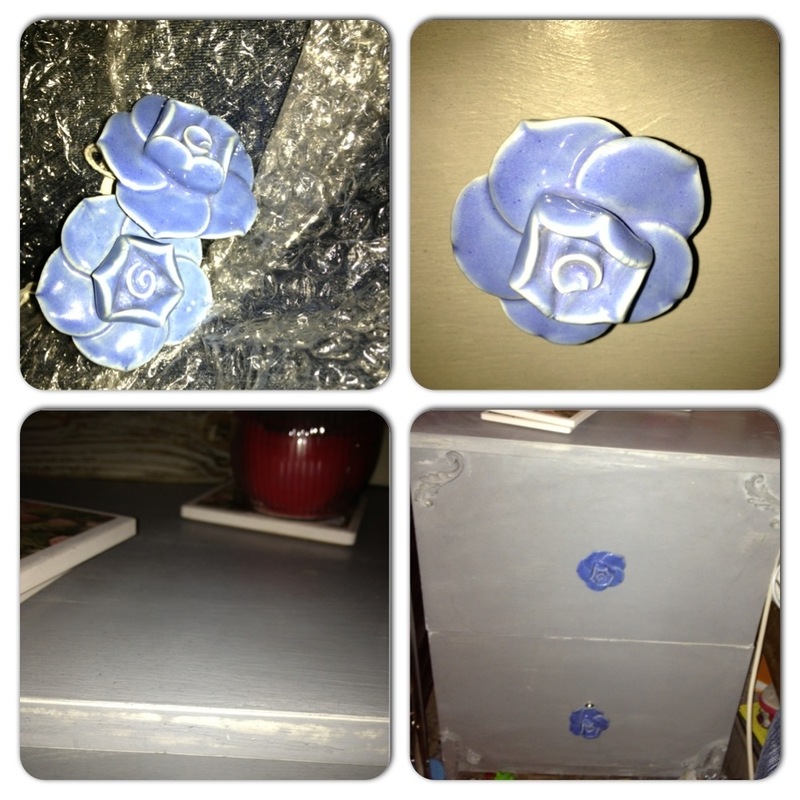 As for my drawers I added my 3 small rose and ornate scrolls to the centre of each draw but decided to paint them first. 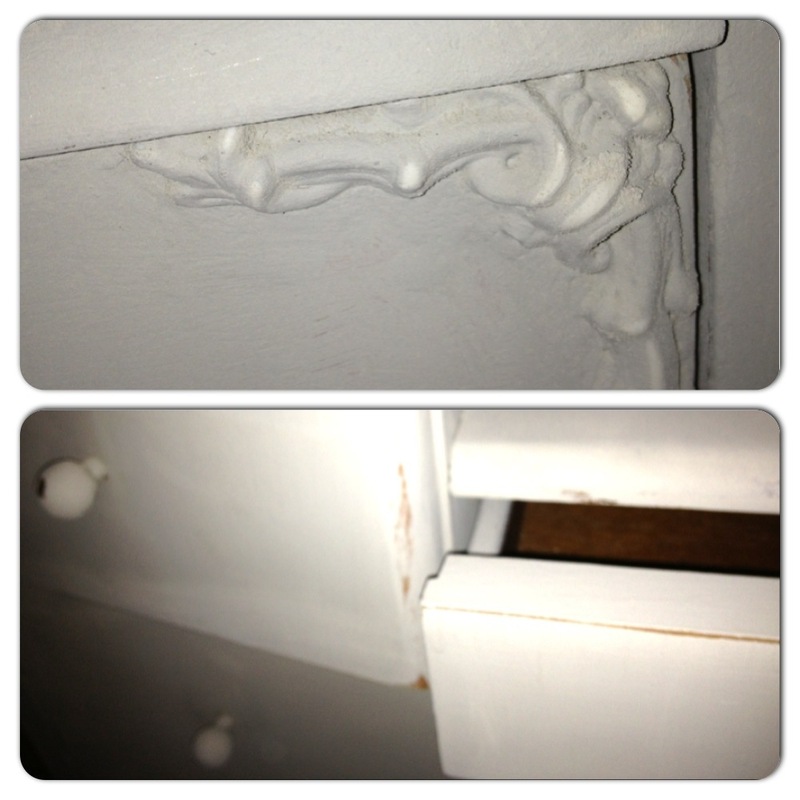 I worked in the same way as I did my dresser only I was more gentle when sanding as I discovered the previous owners had painted these lilic before they painted them white and wanted to ensure it was only the white that was visible when distressed. I painted over the metal Crome handles, distressing lightly as to allow some of the Crome to show through. I had so much fun working on this project. I absolutely love the results and now want to paint all that I own and more. I’ve brought a stunning mahogany magazine rack that I want to refurbish. I’m also planning on using some dark wax for this one… I’m getting brave!